We are a group of ordinary Christians with a hunger for genuine fellowship with deep growth and real joy, underpinned by authentic Biblical teaching. 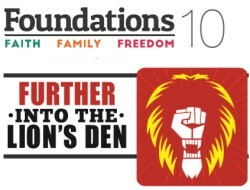 Foundations conferences seek to offer these in an atmosphere of authentic worship in mind, body and spirit. A new kind of Christian Conference. They should be places where folk can really connect with each other, with God … and with themselves, all within the framework of solid Biblical teaching and an exploration of our Hebraic roots. They should be times where there is space for God to act, where there is freedom to explore, rather than acting as directed. We believe that the newly-launched Foundations Regional conferences can provide such a place. Some pics from John Hall - A few photos around the lake taken on the Wednesday afternoon. Were you at F7? Click here to send pictures, testimonies etc. A weekday residential conference held at Quinta Christian Centre, Weston Rhyn, Oswestry SY10 7LR from Monday April 18th to Friday April 22nd 2016. Is the Church today really the best it can be, in the sense of empowering Christians to reach their potential and providing a God-centred, valid and uncompromising expression of the faith we have inherited from past generations? Can we dare to do things a little differently? Either just soak in the discussions and teaching, or bring your gifts and take a more active role. Expect the unexpected as the Holy Spirit leads us into exciting places. Come as an individual or a church group and benefit from mixing with like-minded Christians from a variety of fellowships. WE ARE NOW TAKING DEPOSITS FOR THE CONFERENCE.